My story is that I really wanted to join Roehl, I was bummed out when I did not get in. I started looking around and was not pleased with the pay rates and the fact that every trucking company want to send newbie on the road for 1-3 years for helping them get their CDL. I REALLY did not want to go away from my family for so long but I was going to do what I needed to do. I even tried to find an Owner Operator to lease me their truck so I could take the test (could not find anyone). I google mapped every trucking company terminal in my county and started calling their corporate offices to find out if they offered a CDL training course. I ended up speaking with New England Motor Freight HQ and they told me that they do in face offer CDL training. It is not like your typical company paid CDL training set up. The deal works like this. You work their docks for 3 months or so then you can request that your terminal manager send you for CDL training. (I think that they want to see you come to work and are a good employee and not a goof up) You then get trained get your CDL and work as a driver for them. then they being to take $25 per week out of your pay. if you stay 3 years they give you back the $3,600 in full. you are free to work Local, Regional, P&D, Line Haul, OTR whatever they need at that time! So their HQ put me in touch with the Terminal Manager, I explained that I wanted to get involved in the program so I could drive for them. They had a dock opening and I got hired right there! Once I am done I will be doing Line Haul, home every day .41 cents per mile to start and union benefits too. the per mile pay is WAY better than any OTR opportunity that I found with the any other company paid CDL program. I am sure that there are many more companies doing internal training for newbies many are very small hyper local outfits but many are fairly established regional operators like NEMF but they just don't advertise their programs. So while this may not be an ideal solution for everyone I would encourage those of you who got iced out by your first choice company as I did to continue looking and calling all the trucking companies around you don't give up you get a lot of 'no' but all you need is one yes and you could end up with a situation that works for you much as I did. I am very please to start out at .41 per mile in a stable company. it will look great on my resume and If I don't want to stay in 3 years I will have $3,600 and a solid pay/driving history to shop for a new job with if I choose. As it stands now I am very happy with the way things worked out. That is great news Bucket, Congrats! I am waiting for XPO to give me the final approval. They are running background checks on me she said it could take a couple days. the class on the 15th was full so if I pass the background check I can start on the 22nd. Maybe I will see you there! Roehl has a policy of no 'loss of control' accidents in the last 3 years. if you have one you cannot be hire either full time or as a student in their CDL training program. Roehl (my #1 pick) rejected me for some unknown reason Oh well. Back to the drawing board... I am now looking at XPO and CRST both are recruiting in my area. XPO vs. CRST ... What are your thoughts? What it basically boils down to, is if you want to be Team Driver, or Solo. With XPO, you can always switch if you find that Team is not for you. At CRST, you are bound to their contact, before you can find a new company to drive solo for. I had no idea CRST was team. No I am not interested in team. I will try to get XPO application in. Hopefully they will take me in there program. I will see what happens. Thanks everyone for your insight! Get some pressure stockings. You should find them in the pharmacy area. I got started with these by prescription from my Doc. I think there's some non-prescription ones out there. Thorlos is a GREAT brand best socks I have ever owned. good luck. Wow, so I am squeaky clean and Roehl rejected me which is curious. I read a post somewhere that they will do that if they are not actively recruiting in your area. Oh well. If you work at Roehl maybe you can point me in the right direction? Roehl is my first choice for CDL school. I put in my application and I am good except in 2015 due to the stupid traction control system braking in a turn on ice I put my car into a ditch. The problem was the NYS Trooper have desecration if there is less than a $1,000 damage to NOT write a police report at all. it was not a big deal after I got my wheels back on the road I drove away (no other cars involved). Trooper was really nice and professional they always are in my experience. No ticket, nothing. So as a candidate I am squared away, meaning I have No DUI, DWI, Arrests, Drugs etc. not an alcoholic, no issues what so ever of that type. My recruiter is Jessica (very nice girl). I filled out the app and Jessica said that all she needed was the police report of the accident. I told her about the accident as I don't think that there is any record of it but I wanted to be 100% transparent. "To whom it may concern, This letter serves as a summary of the accident our Liberty Mutual policyholder, Jeff was involved on 1-12-15. This loss was a single vehicle accident as result of hydroplaning and driving into ditch. The police came to the scene but did not find it necessary to file police report. " Jessica said she sent it somewhere to see if it was sufficient or not and that they would let her know in about a week and she would be in touch afterwards. I am going to get my permit Monday morning I was hopeful that I could travel to the school next week and start on nextMonday. The challenge for me is that I cannot really wait another 2-3 weeks to get going with the process. (Why can't I just wait? Long story but I just need to get working ASAP) Does anyone know the name of a person at Roehl I can call to fast track their decision on this minor accident documentation? Any help is greatly appreciated. If I can't get them to pull the trigger I can go elsewhere but I would much rather be at Roehl. Everything Amanda told me has been spot on. I also liked the fact once you get your permit at home, you'll not be asked for any money once you get there. They even pay Missouri the fee for your CDL, and you'll get food and lodging. If for some reason a student doesn't make it, even if they fail the drug test or they quit, the company will still pay for the bus ride home, and not be forced to just figure it out. I would also like to add that if you choose to go to XPO, I won't get a single cent. I'm just someone who is happy with the company I chose, and I'm spreading the word. I appreciate the info Sam. Amanda seems very knowledgeable and straight forward. So I have to decide Roehl or XPO. My recruiter's name is Amanda. The number is 800-641-4748, ext 5565. LOL Thanks Sam. I see I had a contact in my email from them (some conflicting information on their website and what I have in my notes about the hourly pay. website say new drivers make 42.5 cents per mile recruiter said less. I will reach out to Amanda and see what information she has. If you want any info on XPO, I'll be more than happy to provide it. I just went through their program and I am very happy. Good luck to you whatever company you choose and just keep to the task. XPO is not on the list yet but we're working on it now. We had trouble getting in touch with them at first. All of the major carriers have a good staff and respect their drivers. And yet all of them will have a few bad apples in the bunch. That's not really a criteria for selecting a company when comparing the majors. Prime, I couldn't get anyone on the phone, got in the phone tree 3 times for 15+ minutes. I gave up trying to speak to a human. I would certainly not want to rule out a company because it took a little longer to get in touch with a recruiter. Prime is famously difficult to get in touch with but it helps quite a bit if you already have an application in with them. They are certainly one of the best companies out there with one of the highest starting pay rates in the industry so you might consider revisiting this. Whether they would be considered a mid-major or super-major or mini-major makes no difference whatsoever. There is no "sweet spot" when it comes to the size of a company. All of the major carriers that offer training can be a great place to get started. The size of their fleet won't matter. They're all in the upper 1% when it comes to the size of their fleets. When choosing a company to get started with you really want to focus on the type of freight you want to haul and how often you'd like to get home. That right there will whittle down your list. Then apply to all of the companies on your list and see who is willing to offer you an opportunity. It's likely not all of them will. That will further whittle down your list and make the choice much easier. 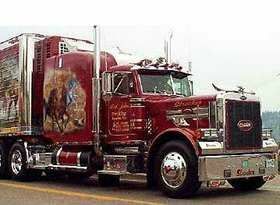 Forum Topics Tagged "Choosing A Trucking Company"
Again, Roehl is a great company so there's no reason not to start there but the same applies to the others on the list. Don't rule out Roehl, but also don't rule out the other companies for reasons that will have no effect whatsoever on your happiness and success like the exact size of their fleet, how long it took to get in touch with a recruiter, and how friendly you think their staff might be. I've been doing my due diligence and if I go with a company that trains, I'll probably end up with Roehl. I like what I've read so far and Roehl has several pluses that I'm looking for in a company, one of which being they go to Canada. sounds good Ukiboy. Good Luck to you! Roehl is a fine company with great well maintained equipment. The ONLY reason i didn't choose them as my first employer was that in my area, it's all slip seating and not always the same truck. I love my creature comforts and it would have been a real hassle for me to move in and out of a truck weekly. Of course it's not that way everywhere. Best of luck on your excellent choice. That is reassuring about them taking care of the trucks. Sue, Thanks a bunch! I am felling good about my choice. Jeff..I don't know much about the other companies you listed. I went through Roehls CDL program in the mothership (Marshfield). It was at the time an excellerated program. In 2-1/2 weeks, I had my CDL. Don't worry, I had plenty of seat time and was tested by a third party. I've been driving for Roehl since on a dedicated account. I wanted that so I would remain closer to my family on the east coast. Roehl is a great company not only to start with, but continue your career. I like your choice, but I'm biased. Good luck! Welcome to The Power of Red!! Awesome, that is just what I wanted to here Tim! We are practically neighbors, I am here in the Hudson Valley too (Otisville) I look forward to training and being part of the team! Overall, this was a really hard decision. The decision is hard because the choices are similar. Most people start out thinking the choice is easier, like between going to Texas Roadhouse or Denny's. They both get the job done (feed you) but one of them has peanuts. People start with that perception, but the choice is more like Denny's or Applebee's. So close! So they don't know what to do. You did the right thing, and looked deeper into your candidate companies: pay rate, pets, company size, and found just the right niche for yourself. Most of the starting companies are the same. It is only a matter of time before Roehl gets cameras as well. I am with Swift right now and most of the reviews you read are from people who expect the world when they barely know anything about the industry. As you will find with this forum we are here to debunk what is said and to help people starting. Roehl is a good company and you will get a good start from them. Do a year with them and your opportunities will grow like crazy! Good luck! Thanks Devan, I kinda figured that cameras are on the way once one does it everyone else will follow...sadly. I like the idea of not having to worries about can I get a load, I know with Swift I would always have access to some kind of run. I also found the recruiter to be a nice guy with a lot of information. Definitely they communicate with folks looking to get their CDL I did not feel neglected at all. I'm not one of the "fellas", but here's my two cents. Roehl has a good reputation, but their no pet policy eliminated them from my list. If you get your CDL through them and are based out of Marshfield WI, you may be sent to school at Fox Valley Technical College in Appleton, WI. If so, be assured that it is a top notch education. That is where I went for my CDL, and it was excellent. My course was 10 weeks, Roehl may be more accelerated.